Ever since that first trailer, we’ve known that Ruth E. Carter’s sublime work on the costumes for Black Panther would make it one hell of a gorgeous movie. 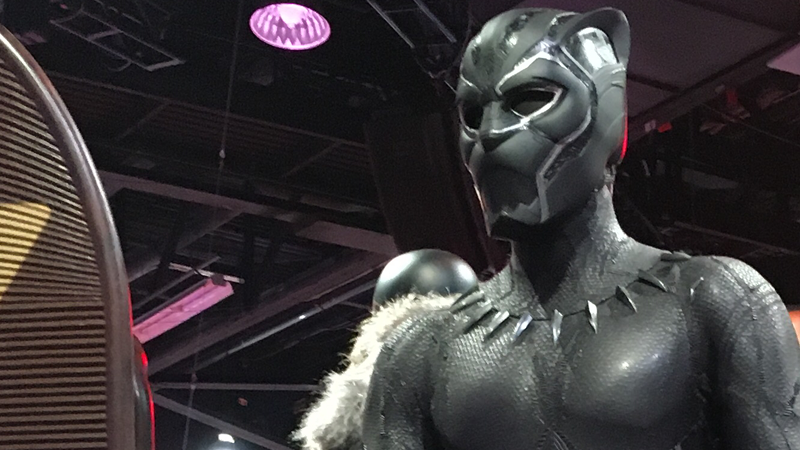 But on the floor at Disney’s D23 Expo in Anaheim, we’ve been able to get a great look at some of the outfits from the film—including T’Challa’s new look. The costumes for Black Panther’s main cast are currently on display at D23, giving us our best look yet (beyond the big tease we got from Entertainment Weekly earlier this week) at the sumptuous work that’s gone into making the denizens of Wakanda look as stylish as they are completely badass. Okoye’s (Danai Gurira) Dora Milaje gear. On top of that, the exhibit has also given us a really clear look at T’Challa’s updated costume for the movie, which includes some notable changes from his Civil War threads. Aside from the new “necklace,” the suit itself is actually a much less-patterned one. Gone are the diamond pieces woven all over the outfit from Civil War, giving it a plainer look that emphasizes T’Challa’s physique and more closely resembles the skintight suit he wears in the comics. The differences really become apparent in the new helmet though—which, while just as intricately patterned and textured as the Civil War helmet was, now actually has a much more defined shape to it, giving it the physical appearance of a Panther’s nose and mouth, and more rounded ears, instead of the softly-featured cowl we saw in Black Panther’s first cinematic outing. Black Panther hits theaters February 16. We’re expecting to hear much more about the movie from D23's live-action movie panel tomorrow, so stay tuned for more from the world of Wakanda.